Finally… it is my pleasure to let everyone see the latest to the Haikelite line the MT09R. This is the 70.2 emitter version, the 35 high should be arriving soon and I will add it as well as some video of the lights side by side. It felt like it took this one forever to arrive, but it only took 4 days. When I took it out of the box the first thing I noticed was that it is a bit shorter than the MT07S… 14mm shorter to be more exact. These new models from Haikelite do not have the same driver issues from the past. 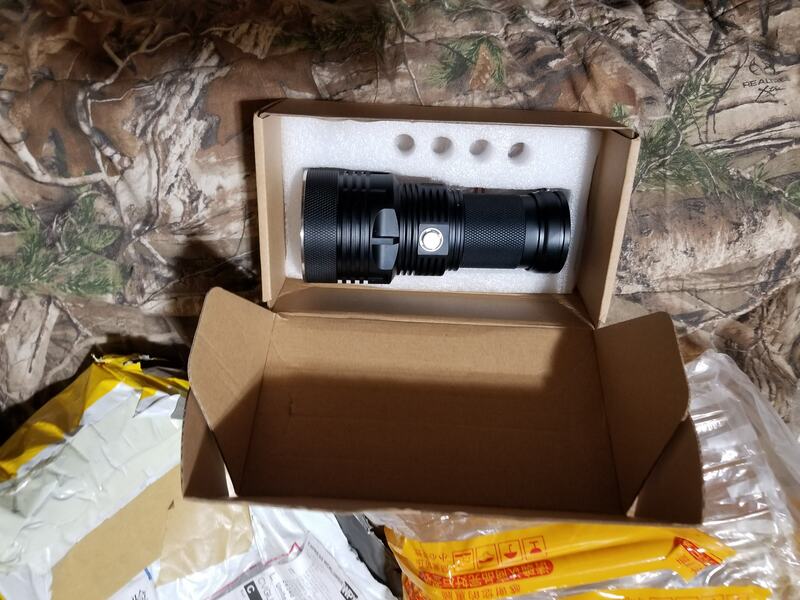 Thanks to Texas Ace they all now use a TA style driver and while I have not yet opened it up to have a look I can tell you that not only will it make the 15k lumen promised but above. My last reading was 16297 lumen. Excellent job. Now on to the distance calculations, I did there twice to be sure and both times I got the same (6 meters difference). 90000 Candela with an est. throwing distance of 600 meters. Now it is gong to be very hard for me to prove 600 meters but I am betting it will out throw it’s older brother the MT07S. We will see how it comes out in the video. The weight is good, and the finish is excellent, all the machining is what we have come to expect from Haikelite. Most of this review will be more for letting everyone see what the light can do so the majority of it will be video. I am not going to tear down either light until after all the testing and video footage has been taken. I do not have the parts here now to repair anything that could possibly get damaged. I have asked for some to be shipped if possible so that when I get the 35 high we can see if there is a performance difference. You definitely need to tell Dale the ramping speed is way too fast. From end to end should be about 2.5 to 3 seconds. Right now it looks like 1 second. How can anyone stop it where they need it? I see a lot of future complaints about this if not fixed. You definitely need to tell Dale the ramping speed is way too fast. From end to end should be about 2.5 to 3 seconds. Right now it looks like 1 second. How can anyone stop it where they need it? I see a lot of future complaints about this if not fixed. I will get that done tomorrow night and see if it can be added to the end of this video. If not I will just add a separate one. So it is 16000lm and 90kcd? I’m talking about the 9:15 to 9:25 mark in the video. It seems to ramp up and down way too quickly. Could you actually stop it at the level you wanted or would you have to keep bumping it up and down to get it just right? Part of what makes Narsil so great is that the button timings have been fined tuned down to the millisecond. If Haikelite has make their own UI from scratch, their button timings might be a bit off. Sooo… for how long can it stay on turbo? I was planing to take it back out tomorrow night but, I just got an email letting me know my new camera will be here Thursday so I may wait until Thursday night as it is a much better camera. I'm talking about the 9:15 to 9:25 mark in the video. It seems to ramp up and down way too quickly. Could you actually stop it at the level you wanted or would you have to keep bumping it up and down to get it just right? Part of what makes Narsil so great is that the button timings have been fined tuned down to the millisecond. If Haikelite has make their own UI from scratch, their button timings might be a bit off. We have timed it several times and it takes just a touch over 5 seconds from low to turbo and the same back...What you saw was I was too click happy, I even though it was ramping until I noticed if I clicked the double a little faster it didn't do that. If nothing else I will shoot the ramping on a wall out here in the show and video it with my cell phone and let you see what I mean,..
I’m talking about the 9:15 to 9:25 mark in the video. It seems to ramp up and down way too quickly. Could you actually stop it at the level you wanted or would you have to keep bumping it up and down to get it just right? Part of what makes Narsil so great is that the button timings have been fined tuned down to the millisecond. If Haikelite has make their own UI from scratch, their button timings might be a bit off. We have timed it several times and it takes just a touch over 5 seconds from low to turbo and the same back…What you saw was I was too click happy, I even though it was ramping until I noticed if I clicked the double a little faster it didn’t do that. If nothing else I will shoot the ramping on a wall out here in the show and video it with my cell phone and let you see what I mean,..
5 seconds? Oh no! That’s too long! I guess a bit longer than Narsil is better than too fast. That way you can stop it more precisely. wow looks so awesome, icant wait too see a video of the xhp35 in action. 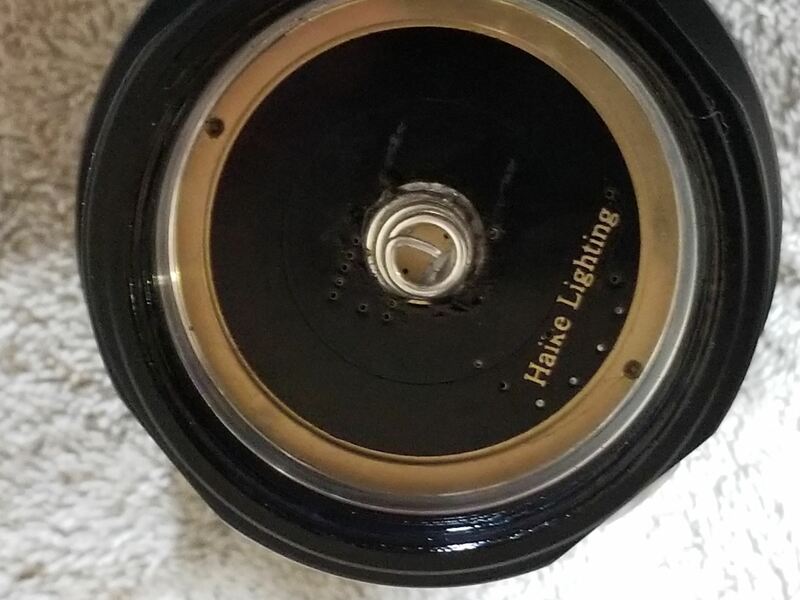 So pumped to get this light! A parallel question (sorry for my ignorance) – does the new 70.2 emitter draw more or less power than the 70 version at its theoretical full brightness? 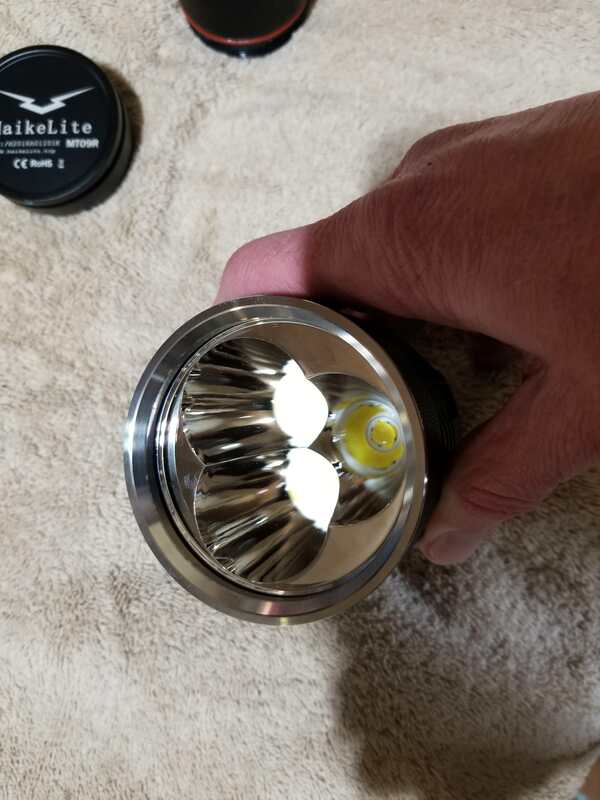 I know it can emit more lumens driven at full, but is it more efficient? In comparing, I would think that a three-emitter 70.2, which can emit about the same lumens as a four- emitter 70, would have less heat and less drain, this extending run times, especially on turbo. anybody with the actual numbers or experience? Thanks! 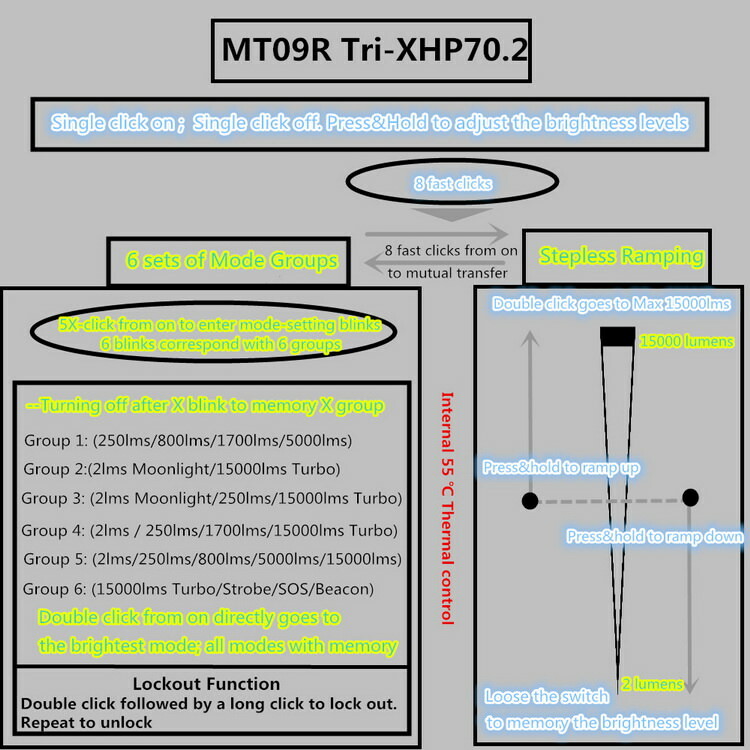 DT70 is using dedomed XHP70. That’s why it has higher throw and less output. It’s more expensive too. The DT70 uses shaved/sliced dome emitters. That might account for the difference in candela. This also lowers it lumen output. The 70.2 is a tiny bit more efficient when driven at the same output. Not anything you would probably notice. 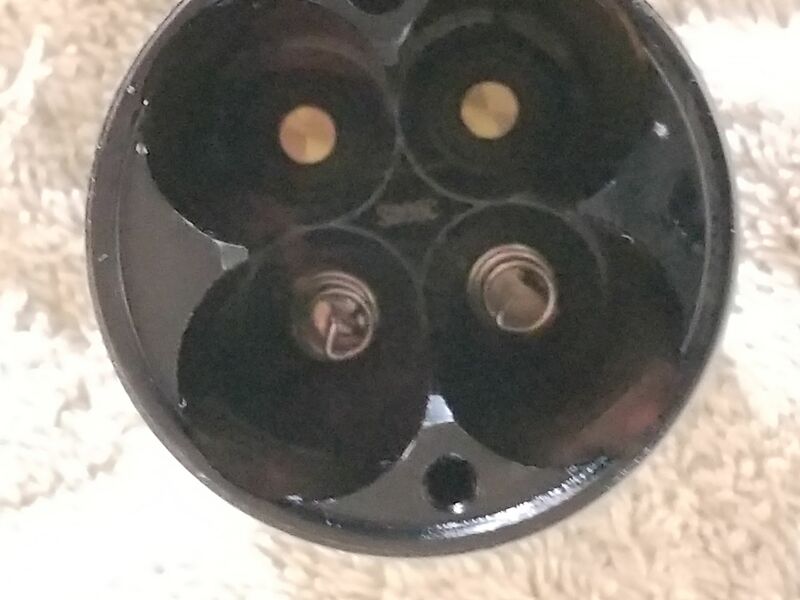 The 3 emitters have to work harder to match the 4 emitters, so actual wattage is still pretty similar. In fact, since the 3 emitters have to work harder, they are running in a less efficient zone than the 4 emitter design. So run time will be a bit less and heat a little more. Probably not enough difference that you would notice, though. So, just to be clear – the run time and throw on the MT09r at approx. 15k lumens will be LESS (due to the emitters efficiency at that level of drive) than the DT70 at 14K lumens? As in, on turbo, the MT09r with three 70.2 emitters will probably step down quicker than the DT70? And will maintain brightness at a medium lumen setting less time than the four emitter HXP 70’s? Again, sorry for the painful clarity and redundant questions – I’m in the market for a BRIGHT soda can light, funds are scarce, and I have a morbid fear of buyers remorse, lol. When you factor in discount codes and the fact that you get batteries included, the price is almost the same, I believe. The problem I've found with the Imalent multi emitter lights is finding one that works... I've been sent 4 samples all of which failed in just a few minutes. I've seen them discounted all the way dowb to dealer cost. The only reason a retailer would every discount that much... Well that seems kind of obvious. One other thing... Those are numbers claimed by Imalent. I am not aware of anyone that has verified the candela on either of the multi emitter models. The 70.2 version of the MT09R is designed to be pretty good at both. Kind of middle of the road. So far it does that better than any light it this price range I've seen. When the thrower arrives I will fully verify it's Candela rating and I have a pretty good idea what it will retail for so I will totally stand by my statement twice the light at half the price. I would by 10 MT09R's at full retail before I would buy any of the multi emitter Imalents even at dealer cost. Thanks for the review! I'm a little disappointed in the candela reading of 90,000. Thats 30% less than the Imalent dt70. I would have thought with deeper, smooth reflectors, the new light would have a better throw and intensity than the Imalent, which has shorter, orange peel reflectors and, according to testing, less actual lumens (around 13,000) A parallel question (sorry for my ignorance) - does the new 70.2 emitter draw more or less power than the 70 version at its theoretical full brightness? I know it can emit more lumens driven at full, but is it more efficient? In comparing, I would think that a three-emitter 70.2, which can emit about the same lumens as a four- emitter 70, would have less heat and less drain, this extending run times, especially on turbo. anybody with the actual numbers or experience? Thanks! The DT70 uses shaved/sliced dome emitters. That might account for the difference in candela. This also lowers it lumen output. The 70.2 is a tiny bit more efficient when driven at the same output. Not anything you would probably notice. The 3 emitters have to work harder to match the 4 emitters, so actual wattage is still pretty similar. In fact, since the 3 emitters have to work harder, they are running in a less efficient zone than the 4 emitter design. So run time will be a bit less and heat a little more. Probably not enough difference that you would notice, though. So, just to be clear - the *run time* and *throw* on the MT09r at approx. 15k lumens will be LESS (due to the emitters efficiency at that level of drive) than the DT70 at 14K lumens? As in, on turbo, the MT09r with three 70.2 emitters will probably step down quicker than the DT70? And will maintain brightness at a medium lumen setting less time than the four emitter HXP 70's? Again, sorry for the painful clarity and redundant questions - I'm in the market for a BRIGHT soda can light, funds are scarce, and I have a morbid fear of buyers remorse, lol. I'm not an Imalent hater some of their best reviews were done by me with their single emitter models. The multi emitter models are just not worth the price. No, I’m not saying that at all. Run times vary depending on the battery. The DT70 running at 14k lumen would actually be higher if the domes were not sliced. Step downs can be programmed to activate at various temperatures. So bottom line is they are very similar to each other. I personally would not by buy Imalent because it is like Russian roulette. Some folks get perfectly working lights and some get ones that break quickly. A high percentage break quickly. If you fear buyers remorse, then don’t buy brand new designs. Wait until they are in many people’s hands and you get lots of feedback. I tend to only buy lights that I can swap the drivers out if they should fail. Lexel makes some great TA drivers. If this Haikelite driver fails, you can easily replace it. Have you seen the Astrolux MF 01? It is a cheaper 18 emitter light with tir lenses. If the driver fails you can replace it with a TA driver as well. Personally I prefer reflector based lights as you get a good balance of throw and spill. 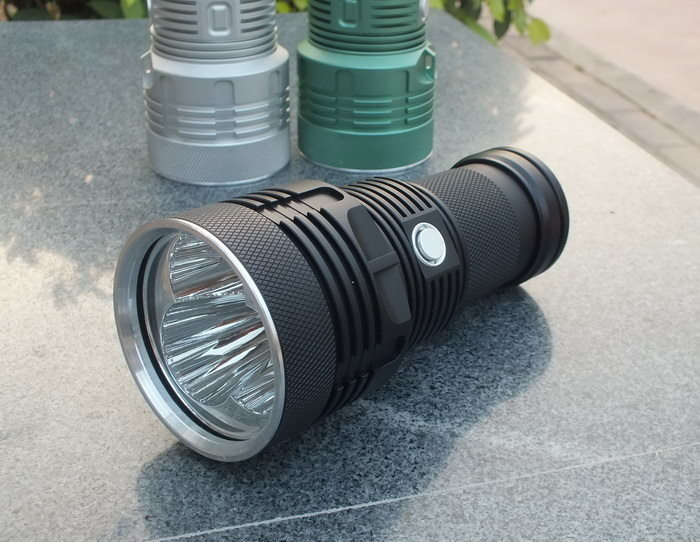 Have you considered getting a blf q8? They can do 7,000 lumen with spring bypasses for about $45. It is cost effective. Does your sample have the cool white emitters? You can tell from the video. The Q8 has NW and the sample has CW. I don’t intend to mod my q8 which i have no skills or equipment. It is good as what it is now. I think q8 is the best value light.. I use it daily around the house.. the light doesn’t step down if I keep it at med mode.. Many cheap lights failed because of the low quality driver. Q8 came in clean every aspect. In the video I think its because of the fog and the cool white and the self adjusting camera, but to me the Q8 looked more impressive in the video. Obviously that is not true its just hard to see in the video. As of right now no.. I do know that it has been and is still being discussed. When I am given a definite answer I will post that right away.